Home » Category archives "Food Gifts for Christmas"
Pralines are best made when the weather is dry–humidity tends to make them grainy. Be sure to use a heavy saucepan, and work quickly when spooning the pecan mixture onto the wax paper. Remove from heat, and vigorously stir in pecans. Spoon pecan mixture onto wax paper, spreading in an even layer. Let stand 20 minutes or until firm. 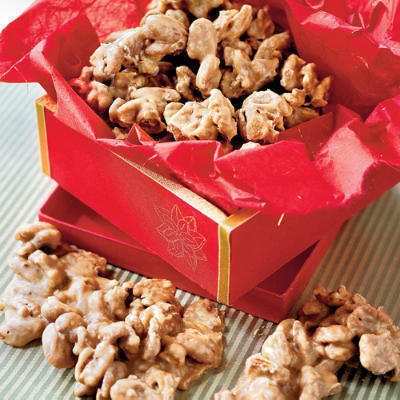 Break praline-coated pecans apart into pieces. Store in an airtight container at room temperature up to 1 week. Freeze in an airtight container or zip-top plastic freezer bag up to 1 month. Line a 15- x 10-inch jelly-roll pan with wax paper. Lightly grease wax paper. Microwave candy coating, sweetened condensed milk, and salt in a 2-qt. microwave-safe bowl at HIGH 3 to 5 minutes, stirring at 1-minute intervals. Stir until smooth. Stir in vanilla and pecans. Spread in an even layer in prepared pan. Cover and chill 2 hours or until set. Turn candy out onto cutting board, and cut into squares. Store, covered, at room temperature.